Francis Guillemard Simpkinson De Wesselow (1819–1906), naval officer, colonial artist in Van Diemen's Land and Port Phillip (1844–48). Nephew of Lady Franklin. Appointed to Rossbank Observatory, Hobart Town, in 1844, he arrived to find the Franklins gone; Sir John, governor of the colony, recalled to England. Simpkinson's training at Royal Naval College, Portsmouth, with thirteen years at sea as a topographical draughtsman, impressed John Skinner Prout, the colony's leading artist. The two men formed a remarkable friendship as landscape painters, which lasted until their departure to England in 1848. 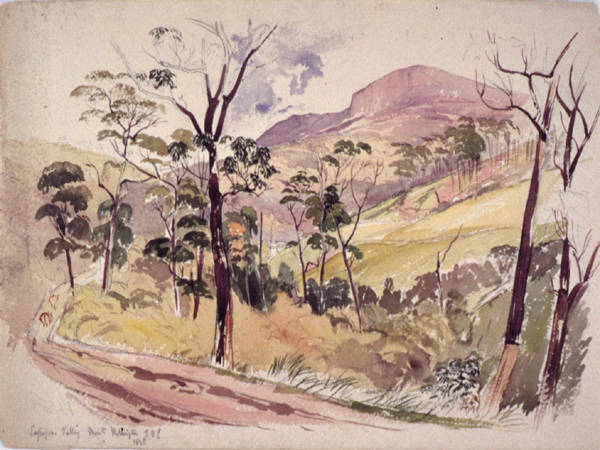 In 1900, Simpkinson gave his entire collection of colonial paintings to the Royal Society of Tasmania. Topographically, his watercolours are unsurpassed. His genius was to combine this with extraordinary fluency and artistic insight. Further reading: M Angus, Simpkinson de Wesselow, Hobart, 1984.